A thermophile is an organism—a type of extremophile—that thrives at relatively high temperatures, between 41 and 122 °C (106 and 252 °F). Many thermophiles are archaea. Thermophilic eubacteria are suggested to have been among the earliest bacteria. 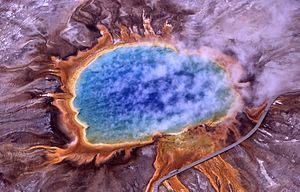 Thermophiles are found in various geothermally heated regions of the Earth, such as hot springs like those in Yellowstone National Park (see image) and deep sea hydrothermal vents, as well as decaying plant matter, such as peat bogs and compost. Hyperthermophiles 80 °C and beyond, but not < 50 °C. Facultative thermophiles (also called moderate thermophiles) can thrive at high temperatures, but also at lower temperatures (below 50 °C (122 °F)). Hyperthermophiles are particularly extreme thermophiles for which the optimal temperatures are above 80 °C (176 °F). A colony of thermophiles in the outflow of Mickey Hot Springs, Oregon, the water temperature is approximately 60 °C (140 °F). Many of the hyperthermophiles Archea require elemental sulfur for growth. Some are anaerobes that use the sulfur instead of oxygen as an electron acceptor during cellular respiration. Some are lithotrophs that oxidize sulphur to create sulfuric acid as an energy source, thus requiring the microorganism to be adapted to very low pH (i.e., it is an acidophile as well as thermophile). These organisms are inhabitants of hot, sulfur-rich environments usually associated with volcanism, such as hot springs, geysers, and fumaroles. In these places, especially in Yellowstone National Park, zonation of microorganisms according to their temperature optima occurs. Often, these organisms are colored, due to the presence of photosynthetic pigments. Thermophiles can be discriminated from mesophiles from genomic features. For example, the GC-content levels in the coding regions of some signatures genes were consistently identified as correlated with the temperature range condition when the association analysis was applied to mesophilic and thermophilic organisms regardless of their phylogeny, oxygen requirement, salinity, or habitat conditions. Sulfolobus solfataricus and Sulfolobus acidocaldarius are hyperthermophilic archaea. When these organisms are exposed to the DNA damaging agents UV irradiation, bleomycin or mitomycin C, species-specific cellular aggregation is induced. In S. acidocaldarius, UV-induced cellular aggregation mediates chromosomal marker exchange with high frequency. Recombination rates exceed those of uninduced cultures by up to three orders of magnitude. Frols et al. and Ajon et al. (2011) hypothesized that cellular aggregation enhances species-specific DNA transfer between Sulfolobus cells in order to provide increased repair of damaged DNA by means of homologous recombination. Van Wolferen et al., in discussing DNA exchange in the hyperthermophiles under extreme conditions, noted that DNA exchange likely plays a role in repair of DNA via homologous recombination. They suggested that this process is crucial under DNA damaging conditions such as high temperature. Also it has been suggested that DNA transfer in Sulfolobus may be a primitive form of sexual interaction similar to the more well-studied bacterial transformation systems that are associated with species-specific DNA transfer between cells leading to homologous recombinational repair of DNA damage [see Transformation (genetics)]. ^ Madigan MT; Martino JM (2006). Brock Biology of Microorganisms (11th ed.). Pearson. p. 136. ISBN 0-13-196893-9. ^ Takai T; et al. (2008). "Cell proliferation at 122°C and isotopically heavy CH4 production by a hyperthermophilic methanogen under high-pressure cultivation" (PDF). PNAS. 105 (31): 10949–51. Bibcode:2008PNAS..10510949T. doi:10.1073/pnas.0712334105. PMC 2490668. PMID 18664583. ^ Horiike T; Miyata D; Hamada K; et al. (January 2009). "Phylogenetic construction of 17 bacterial phyla by new method and carefully selected orthologs". Gene. 429 (1–2): 59–64. doi:10.1016/j.gene.2008.10.006. PMC 2648810. PMID 19000750. ^ Stetter, K. (2006). "History of discovery of the first hyperthermophiles". Extremophiles. 10: 357–362. doi:10.1007/s00792-006-0012-7. ^ Zheng H; Wu H (December 2010). "Gene-centric association analysis for the correlation between the guanine-cytosine content levels and temperature range conditions of prokaryotic species". BMC Bioinformatics. 11: S7. doi:10.1186/1471-2105-11-S11-S7. PMC 3024870. PMID 21172057. ^ a b > Fröls S; Ajon M; Wagner M; Teichmann D; Zolghadr B; Folea M; et al. (November 2008). "UV-inducible cellular aggregation of the hyperthermophilic archaeon Sulfolobus solfataricus is mediated by pili formation". Mol. Microbiol. 70 (4): 938–52. doi:10.1111/j.1365-2958.2008.06459.x. PMID 18990182. ^ a b c Ajon M; Fröls S; van Wolferen M; Stoecker K; Teichmann D; Driessen AJ; et al. (November 2011). "UV-inducible DNA exchange in hyperthermophilic archaea mediated by type IV pili". Mol. Microbiol. 82 (4): 807–17. doi:10.1111/j.1365-2958.2011.07861.x. PMID 21999488. ^ Fröls S; White MF; Schleper C (February 2009). "Reactions to UV damage in the model archaeon Sulfolobus solfataricus". Biochem. Soc. Trans. 37 (Pt 1): 36–41. doi:10.1042/BST0370036. PMID 19143598. ^ van Wolferen M; Ajon M; Driessen AJ; Albers SV (July 2013). "How hyperthermophiles adapt to change their lives: DNA exchange in extreme conditions". Extremophiles. 17 (4): 545–63. doi:10.1007/s00792-013-0552-6. PMID 23712907. "Thermoprotei : Extreme Thermophile". NCBI Taxonomy Browser.